The original 7 Wonders has not let up since collecting a full slate of awards, following its release back in 2011. Several expansions have been well-received, but none have managed to fix the game's most glaring flaw: the rules for two-player matches are pretty rough. As a result, here comes 7 Wonders: Duel, built solely to focus on the two-player experience. Card drafting is out, and instead, each deck of cards is laid across the table in some form of pyramid shape. As players take cards, working their way from bottom to top, they'll make cards on higher levels available. With a blend of face-up and face-down pyramid rows, players will tread carefully to not open up too great an opportunity for their opponents, adding a major element of strategy in climbing the pyramid. There's fresh blood in the credits as well, with prolific game creator Antoine Bauza collaborating with fellow tabletop superstar Bruno Cathala (hot off of Five Tribes and Abyss). These tag team champions have managed to craft an experience that stands on its own legs, while still feeling very much inspired by its source material. 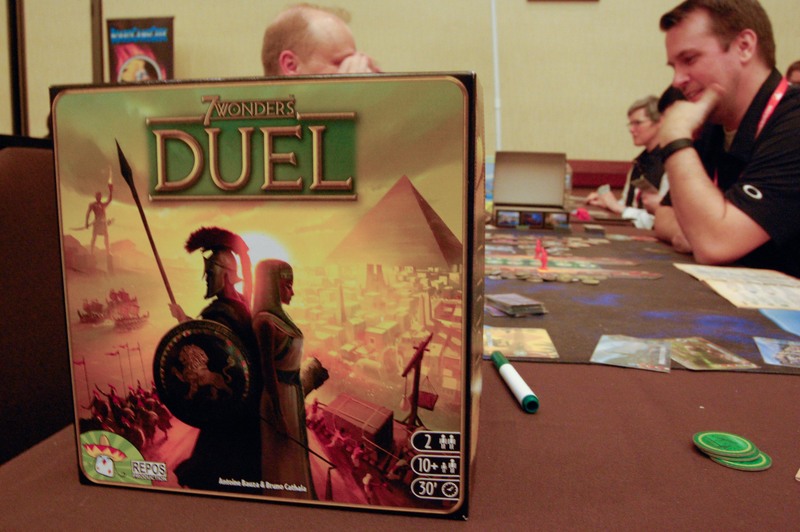 7 Wonders: Duel was an Essen release staged for quick worldwide distribution, and landed in stores mid-November.